(1) the layered framing: We start with a voiceover comparing present day NSA surveillance with the much more primitive methods used in the ’80s only to then move back yet again to the early ’70s and a strongly abbreviated history of Pinochet’s military coup. The voiceover narrative evokes films like Goodfellas and Casino, gangster narratives told after the fact. In the end, however, the voiceover keeps the viewer at a distance and often carries the burden of exposition of the highly complex historical and political realities that create the backdrop to the moments we see on screen. In fact, at times it feels like the complexities of reality are at odds with the need for characterization, if not sympathetic protagonists, within this fiction. 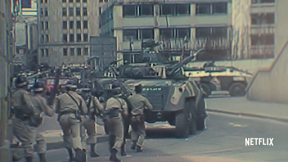 (2) the original footage: In the brief historical summaries, the text uses historical footage suggesting the historical veracity of the narrative. In fact, the entire pacing combined with the voiceover often resembles a documentary more than a television drama. 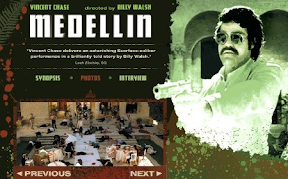 Unlike historical fiction that focuses on fictional or composite characters to elucidate the truth of an era or a phenomenon, Narcos places Pablo Escobar front and center, telling his story as fact. 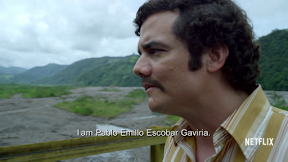 And yet the entirety of reality is undermined by prefacing the first episode with defining magic realism as “a realistic setting…invaded by something too strange to believe.” The layering and the verisimilitude suggest that the show is an epistemological inquiry to get to the truths of Pablo Escobar, and the show endeavors to unravel those truths slowly and carefully. The leisurely pacing and often gorgeous backdrop scenery with its clearly marked ’80s fashion all add to a level of care that supports this endeavor—all the while foregrounding and enforcing its fictionality. (3) the language: As a native German speaker, few things throw me out of a show more quickly than Germans in Germany speaking accented English to one another (like in the recent Sense8). If I suspend my disbelief, they should speak fluent English just like any Star Trek alien does. Or they should be German speaking German and just be subtitled. 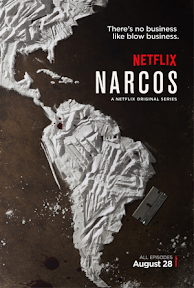 Narcos yet again tries to invoke a sense of authenticity and documentary evidence by presenting the large majority of the show in Spanish with subtitles. 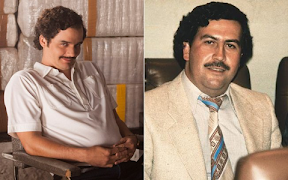 However, I use the term “tries” purposefully, because while I was initially very excited about the choice to present a show primarily in subtitles, it turns out verisimilitude only goes so far: Wagner Moura, who plays Pablo Escobar, is Brazilian (apparently he and director José Padilha are BFFs). My Spanish native speaker friends tell me that the show is surprisingly good in its linguistic authenticity, but that cannot make up for the fact that the central character speaks Colombian Spanish with a clearly noticeable Brazilian accent. Apparently, US monolinguals or, at least, non-Spanish speakers are the primary, if not only, audience. Last not least: I’m glad I’m not the only one who immediately thought back to Entourage’s Vincent Chase playing Pablo Escobar.